Okay, so I really want a chance at the fresh squeeze random drawing. So I am showing them more. This time the subway art is used as a rainbow. I am not sure how many times I can enter, so I made 2 cards and a treat bag. Well...it can be deleted if it is.. No Worries. I love their stamps. Do you ever get that way? Just get a little obsessive and want a stamp set. 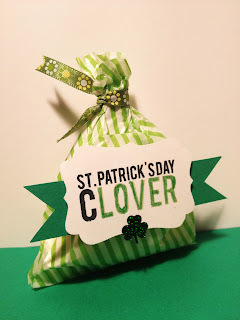 This entry is a Mini Treat Bag for St. Patricks! 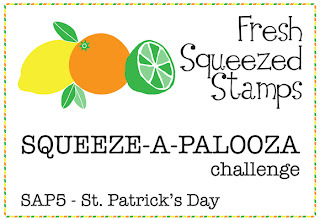 Fresh squeezed stamps is having their monthly Stamp-a-palooza Challenge! This is an entry, and it is VOTED on. then I can be more crafty and make more cards! Please, play too! 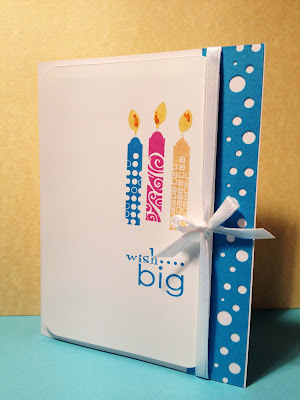 So much fun that Fresh Squeezed Stamps has a free digi to use! Well what do you find at the end of the Rainbow? Ok Ladies and Gents, I Really, really gots to get me some more fresh squeezed stamps! I have only this one set the Subway Spring Series, and it is awesome. Silver and Sparkles ..Oh my! Ok, so I absolutely LOVE Silver! Silver and sparkles. Oh my! 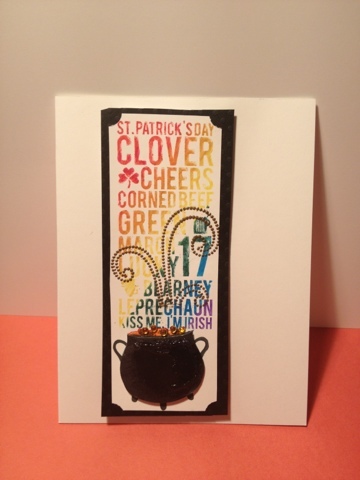 Another card for CAS-ual Friday! 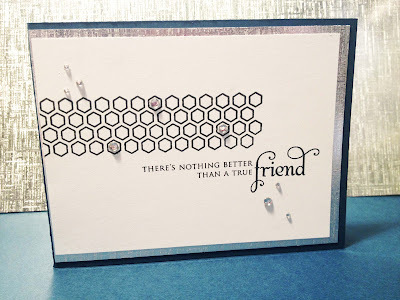 I wanted to use this very graphic hexagon border stamp. 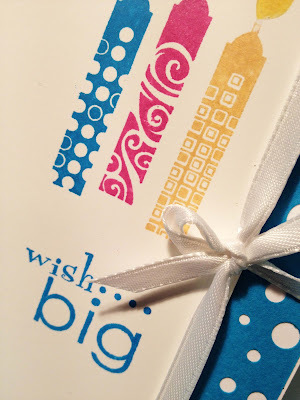 On Ardyth's MASKerade blog, she used a terrific SUPER shiny Black card stock that inspired me to when I was out and about to look over the other papers that I usually may not use. I love getting back to card challenges. A week off, felt like a summer off! CAS - ual Fridays NEW Challenge ..is HI HO SILVER! I saw some incredible cards with the silver. Angie's card at her Blog Schwoooo! was so Phenomenal I perused the Internet a little, saw another card that inspired me and got up off my keister and ran to the craft room. Yes, ..well it was a quick sprint rather than a run. Ladybug Designs Jennifer Blum's Card was my inspiration and starting point for this card. I love the doilies intricate pattern, so fine and delicate. Another post for a CAS card Challenge: Less is More! The other card of Butterflies was not really what they were looking for. So I had to dig deep. The image is pretty large. I really wanted to use a plane. This is the only one I have. lol. I do really like the faded colors..
Scott really likes this one. We said to add that it is the old WTSA colors.. Like I knew that (not). however he said he doesn't get Easter from it. That is okay. ...Ummm...So is subtle. Scott is more of a Bunny kind of kind of guy. I am more of a little chick kinda gal! He said if I add jelly beans, he would really be in to it then! Well after feeling horrible most of the day, I am somewhat better. I am not very happy with how I captured this. (Excuses, excuses.) lol.. 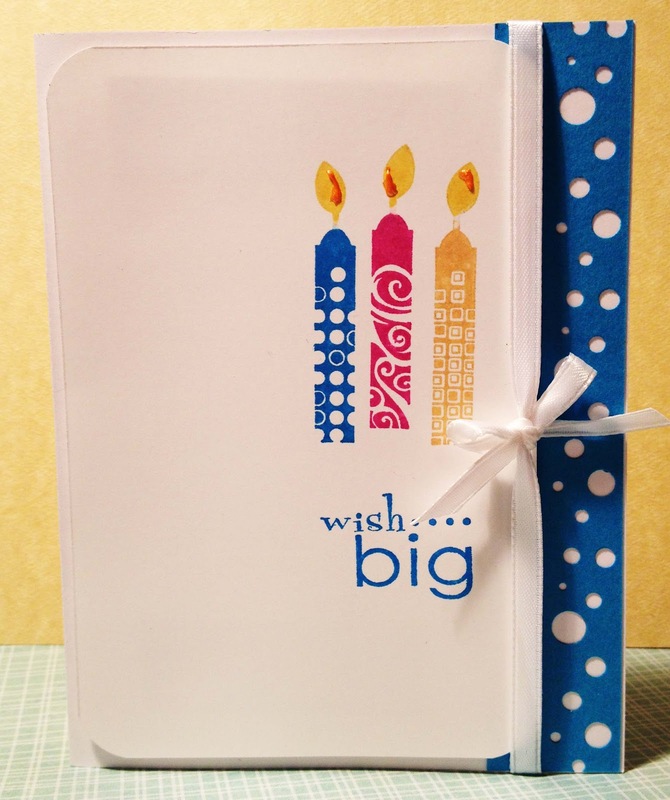 I loved Rosemary's large candle card. So I scrambled around the other day trying to find my candle stamp. I finally found it and put it aside. I continued the circle theme with the border punch. There are also circles within the sentiment as well. Coolest thing, I received Honorable Mention at CAS ology for this Card (Big smiles) Thanks! Well, it is with a little sadness that Conrad has decided to not go continue with Scouting. His Scouting was so much fun and he has learned a lot! His Den Leader was great and meetings with his guidance will be missed! With this sadness comes an open door for more Karate. This Saturday is the Hayashi-Ha Cup in Lynnwood at the Edmonds Community College Gymnasium. So instead of Monday Scouts, Conrad was brushing up on his Kata routine for competition. This is a great start at his competition for the Championship Tournament that is in May! Another playdate with the Papertrey "In Bloom" collection. These stamps are bold and lovely! I really think this simple card will be one for the next card class. It is fast, fun and easy! I usually try to limit stamp purchases to once a quarter. OK, and holidays too. Or for a special project. January I purchased some Papertrey, and a few new sets came out January and this February after Valentine's Day. Fresh Squeezed stamps had new arrivals too. 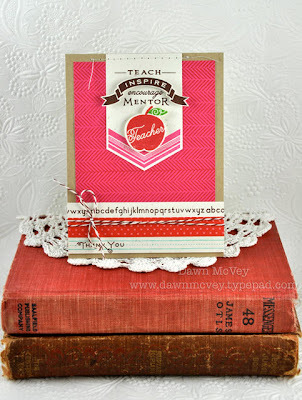 Later this week I will play with the Papertrey dies and stamp sets for in bloom. Today since I was thinking about my good friend, I used just the sentiments. I am just getting back in the swing from taking a week off vacation, so I will be slowly getting back at posting more cards! Posting also to : Allsorts Challenge: Things with Wings! 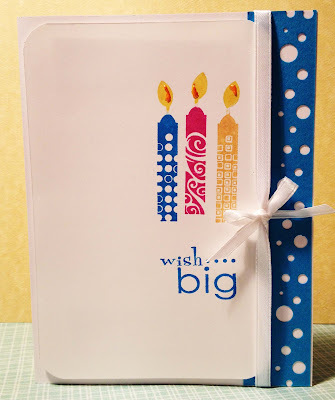 Posting also to: Daring Cardmakers: Fly Fly Butterfly! Posting also to: Alphabet Card Challenge Blog: A is for Anything with wings! There were not too many supplies on this one! 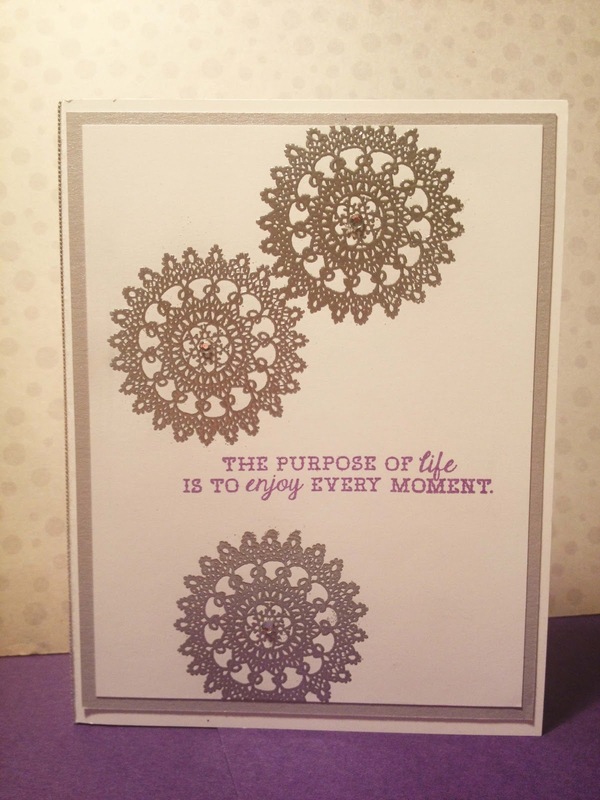 This afternoon I was so nicely delivered my Stampin up! order. So I dug right in and paired an older stamp set 'Fabulous Florets" with the "Bloomin Marvelous" sentiments. I adore poppies. What a stark contract they are. The so bright red against the black. I spoke to a dear friend of mine today. And I guess a good talk was the ticket she needed. I have known her for many years and she always puts others before herself. Now she may have found a bit of true happiness, and she is a little scared to venture forward. I support her all the way! The glossy accents are not dry yet. I always have plastic packaging from one thing or other. then as careful as I could used my exacto to make the template. 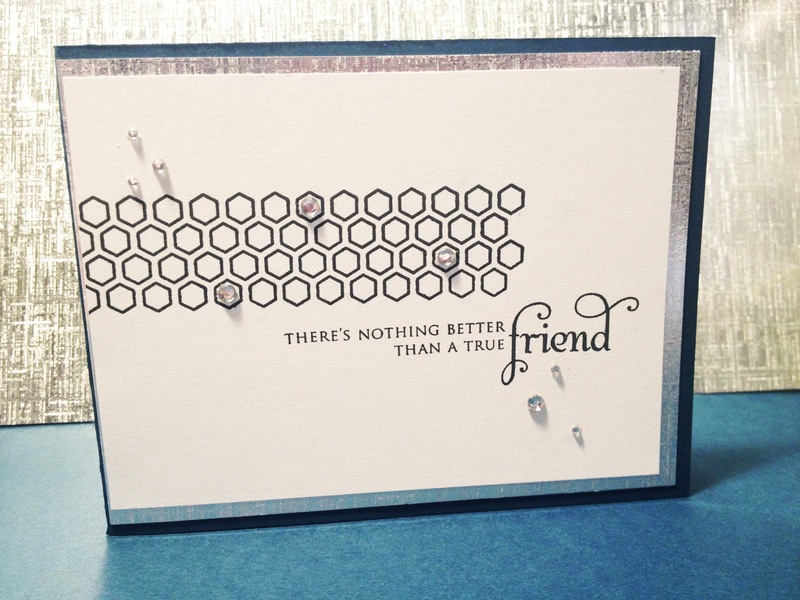 Punch: Martha Stewart Lattice, Stampin Up! it just happened to be a good deal on that day. Dustin had to admit it was HOT! Wow, look at the tickets! Excellent Hamburgers at the Burger Claim! Well. we didn't actually eat any of these, but they sure looked awesome! 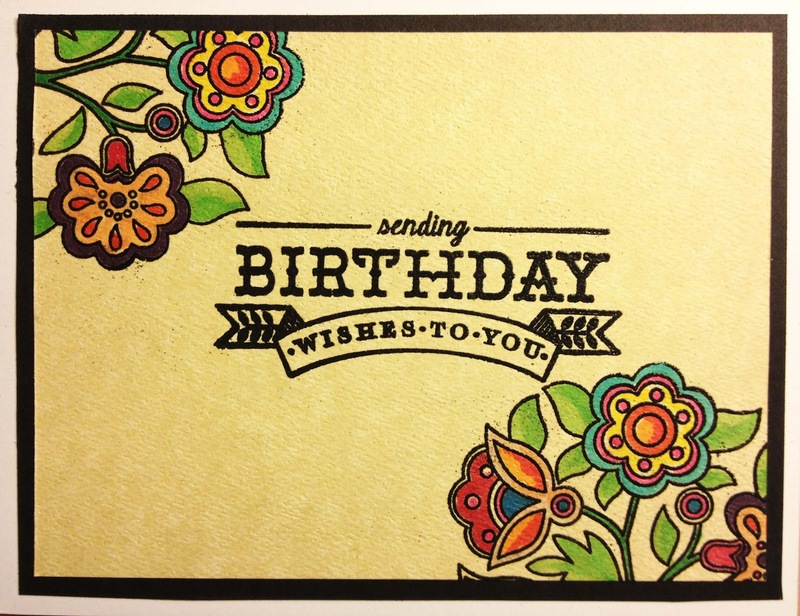 I really liked the lettering "Old School" style of the Papertrey Ink Inspire and Teach set. I remembered the card I really liked was in a magazine somewhere in my piles... so I scoured the internet and found a very nice card by Dawn McVey's blog has so many wonderful cards for Papertrey. I stole some time away to play with the new Papertrey Ink stamp set Folk Art. If you love copics, this set is for you!